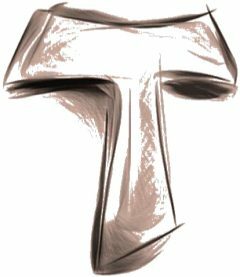 The Transitus Service is an annual Franciscan devotion for religious and secular alike observed over the past three decades. Each year on the evening of October 3rd, we remember the passing of Francis of Assisi from this life into God through a Transitus ritual. The Transitus has become a significant annual event where we ritually revisit the story of Francis’ passing. It specifies the living memory of Francis; it intensifies our commitment to follow Christ in the way of the poor man of Assisi. 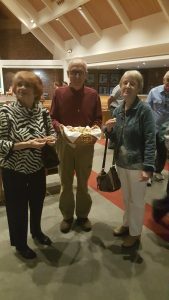 The Fraternity of Brother Francis, Newton NC celebrated the annual Transitus service with our brothers and sisters and a few guests. What a powerful evening of spiritual awakening and fraternity!! We began by dimming the lights in the little church of St. Joseph’s Newton NC and lighting two candles on a small burlap covered table surrounded by little statues and icons of our beloved Brother Francis. In front of the table a brown hooded shroud with a knotted rope waist cord lay at the foot of the table cascading down the altar step, empty, bodiless, as our Seraphic Father is no longer in this world. With the mood and spirituality focused on God, we prayed the Franciscan Proper Evening Prayer at the beginning of our intimate Transitus service. We paused and passed bread in an offertory basket to our brothers and sisters as we read how as Sister Death was approaching, our holy father Francis commanded that bread be brought to him and ceremonially blessed and broke it, giving it to those at his side whilst the book of St. John, “Before the feast of the Passover” was read to him as Thomas of Celano shares in “The Desire of a Soul” Chapter CLXIII, #217. 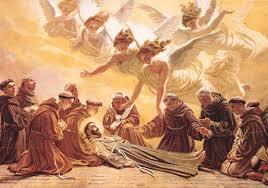 What a beautiful tribute and remembrance of our dear St. Francis. What a powerful evening of spiritual awakening as we joined together, praying and breaking bread as a Fraternity on a perfectly peaceful North Carolina October evening. God is so Good. St. Francis, pray for us. An annual Franciscan devotion for religious and secular alike observed over the past three decades is the Transitus. Each year on the evening of October 3rd, we remember the passing of Francis of Assisi from this life into God through a Transitus ritual. The Transitus has become a significant annual event where we ritually revisit the story of Francis’ passing. It specifies the living memory of Francis; it intensifies our commitment to follow Christ in the way of the poor man of Assisi. Transitus 2016 the Fraternity of Brother Francis was welcomed by our Secular Franciscan Order brothers and sisters of St. Maximillian Kolbe Fraternity of Huntersville, NC. We spent a beautiful evening at Our Lady of the Assumption Church in Charlotte NC enjoying the beauty of the Transitus ceremony and fraternal bonding with our brothers and sisters.